National Stroke Week 2017 takes place from Monday 4 to Sunday 10 September. In support of this National campaign Your Health Hub are conducting free health checks at our Bellerive Clinic during that week. We will also be sharing some valuable information on our social media that may help you save a life whether it be your own or someone else’s. This year Stroke Foundation is asking Australians to join the F.A.S.T. Response Team by knowing and sharing with your friends and family the signs of stroke. Stroke is always a medical emergency. Time is critical in treating stroke. Paramedics, nurses and doctors can only help if you join the FAST Response Team and dial 000 at the first sign of stroke. Think F.A.S.T. 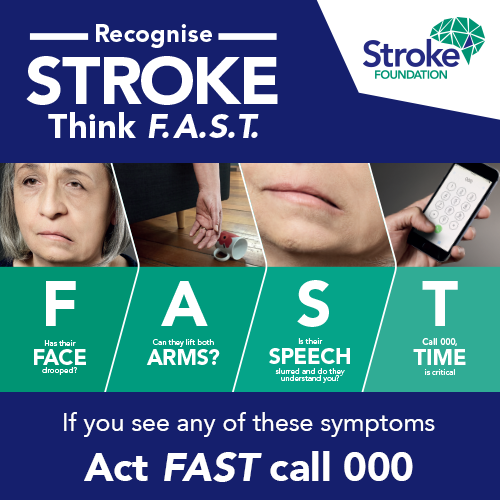 and act FAST this National Stroke Week – join the FAST Response Team. You could save a life. Call our friendly staff on 61220150 for more information or to book your free health check.